K & G Limousine is the premier provider of luxury limo service in Westbury NY Long Island. Our commitment to excellence is unmatched. From making your reservation to arrival at your destination, our goal is to provide a comfortable, safe, and reliable experience. We are dedicated to the highest standards in customer service. When you need luxury limousine rentals in Boise and throughout New York and Long Island, K & G Limousine can make the occasion an event to remember. Limo services for Weddings, Proms, Birthdays or transportation to the All Airport are just a few of the limousine rental packages provided. K & G Limousine has a fleet of luxury K & G limousine rentals with prompt professional chauffeurs to get you where your going in style . K & G Limousine provides Limo and Town car services to all major Airports in NYC and Long Island. When you need Limo and car services from Westbury to JFK airport or Limo and car services from Westbury to LaGuardia Airport then K & G Limousine is No 1 choice for everyone . Schedule your private car and Limo service to and from JFK and LaGuardia airports or around town in the New York. We have a wide choice of Stretch Limousine, sedans, town cars and SUVs, all come with our professional, insured private drivers who provide consistent customer service and focus on your safety, comfort and satisfaction. For Wedding transportation services you can trust, K & G Limousine is definitely the name to remember. We specifically provide Wedding Limousine, Party buses. Do you dream of using the wedding transportation services of a wedding car hire that works to fit your program and logistics? Do you want to be ridden by chauffeurs who perfectly know and understand the location of your event or other locations to visit during your Big Day? Transportation to and from your wedding should be as unique as you are! You will want to hire wedding cars that are meaningful to you as a couple. Think about both comfort and style, as you will want to feel pampered on your wedding day. Our team will work with you in planning and executing perfect transportation for your wedding! We are always on time, we can work with your photographer, Videographer and caterers to provide seamless worry free service on the most special day of your life. Rent a Luxury Prom Limousine Service to Make Your Prom Night wonderful! A prom is an event where memories are made with our friends and dreams come true for high school seniors. Hiring a limousine for prom is the best choice for the students and the parents. We at Westbury NY Prom Limousine offer a wide range of choices. You can make a selection from prom limo sprinters, prom party buses and prom SUV limousines among others. If you are feeling really adventurous, we can arrange vintage cars as well! Parents normally remain worried about the children who are driving late at night. 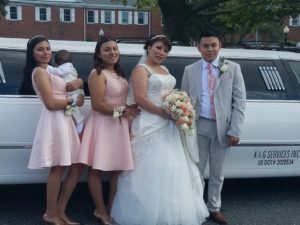 These limos are a wonderful choice for the kids to reach their gathering in a completely secure manner. A prom limo is considered as the secure and highly trustworthy form of transport. Now, there is no need to get worried about the child driving back home at late night. Prom Limo Transportation Allows numerous stops to move the kids to anywhere they wish to go ahead no issues. Whether It’s to the nearby beach or finding a place to enjoy food after dancing the whole night away. K & G Limos & Buses is a modern and sophisticated chauffeured service for bachelor/ bachelorette parties. Our luxury limousines and party limo buses easily allow you to create the perfect atmosphere for your Bachelor or Bachelorette party. Our luxury limousines and party buses come complete with custom plush seating, flat screen TVs. This coming-0f-age celebration is a special day. This pivotal milestone marks another step towards growing up; K & G Transportation offers a variety of packages that would add the perfect topping to such a special day. In K & G Transportation fleet we have plenty of brand new vehicles to choose from, our Limousines & party Buses will be perfect for your special day, if you like to plan this party perfect we can help so call us today and make your reservations.